If you lived through the mid-aughts, the name Blair Waldorf should instantly conjure up the phrase Upper-East-Siders along with visions of headbands, belts, and platform heels. It may be 11 years since Gossip Girl first aired on the CW, but fans of the show's New York prepsters still wax poetic about the epochal looks of Queen B. 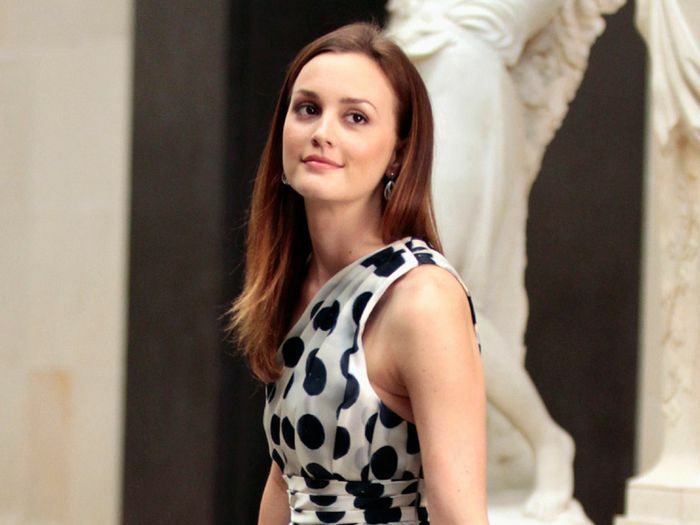 While actress Leighton Meester has left her days playing Waldorf long behind her, we can't help but draw comparisons between her style now and the defining role. This week, Meester walked a red carpet in Los Angeles wearing a dress that immediately reminded us of similar styles Blair wore on screen. The graphic polka dots, the waist-clinching belt, and the statement sleeves all felt like modern updates to the Blair we knew and loved in 2007. So, of course, we dug up a few photos for comparison purposes. Below you'll find both Meester now and on set way back when, proving definitively that Blair Waldorf would be all over this dress in 2018. You know you love her, so read on to check it out. On Leighton Meester: Zimmermann dress; The Row sandals. The details on this dress: romantic sleeves, a bold polka-dot print, and a contrasting belt have definite Blair potential. Meester as Blair Waldorf in a belted leopard-print dress and platform heels. Gossip Girl's Blair Waldorf wearing a one-shoulder polka-dot dress and black platform heels.